Facebook says it has suspended 70 Facebook accounts, 138 Facebook pages, and 65 Instagram accounts controlled by the Internet Research Agency. Chief security officer Alex Stamos announced the news today, posting a handful of sample ads and pages that it says were run by the Russia-linked disinformation outfit. “The IRA has consistently used inauthentic accounts to deceive and manipulate people,” writes Stamos. “It’s why we remove every account we find that is linked to the organization — whether linked to activity in the US, Russia or elsewhere.” Facebook has also removed any ads linked to these accounts. According to Stamos, finding the pages took “months of work” by Facebook. Around 95 percent of the pages with language-specific content were aimed at Russian speakers, and 1.08 million users followed at least one of the pages. The Instagram accounts had a total of 493,000 followers, and the accounts had collectively spent around $167,000 on ads since the start of 2015. 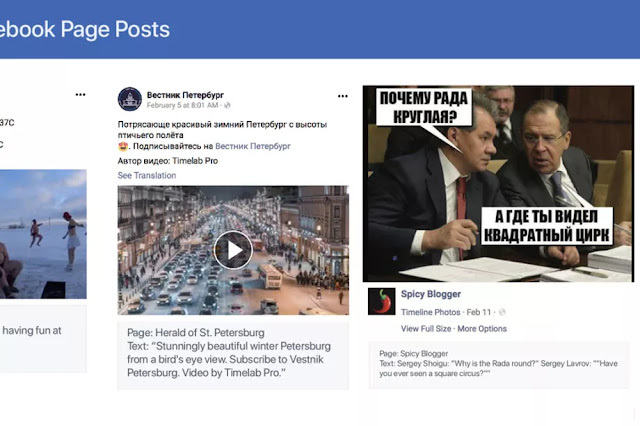 Facebook’s sampling of IRA posts includes pages called RuOpen, Politkach, and Spicy Blogger, posting content like political jokes and a request for “strange or scary” stories from readers. Stamos says they were removed purely for being secretly associated with the IRA, not for problems with the content. Mark Zuckerberg said in a Facebook post that this update was “about taking down [IRA] pages targeting people living in Russia,” as opposed to ones designed to influence foreign elections. “This Russian agency has repeatedly acted deceptively and tried to manipulate people in the US, Europe, and Russia — and we don’t want them on Facebook anywhere in the world,” he wrote. This announcement comes as Facebook is weathering a separate political controversy involving Cambridge Analytica, the political data mining company that siphoned data from up to 50 million users before the 2016 US elections. Facebook has consistently denounced the IRA for betraying Facebook’s core ethos of “authenticity.” Last year, it identified around 3,000 divisive ads aimed at American users during the elections, and suspended 30,000 allegedly fake accounts in the leadup to the French presidential election, alongside a system for fact-checking news. Facebook released a tool that lets people see if they liked or followed a propaganda account, and it plans to update this tool to include these new pages. 0 Response to "Facebook suspends 273 accounts and pages linked to Russian misinformation agency"